Jo Nesbø has sold over 9 million books – Jackpot is based on a story you haven't read. Oscar Svendsen wakes up, terrified and bloodied; a shotgun in his hands, in what was once a respectable strip joint near Svinesund, Sweden. He is surrounded by eight bodies, and police detective Solør has a gun aimed at his chest. Solør is convinced of his guilt, but Oscar persistently denies any wrongdoing. Reluctantly Oscar starts relating the incredible story of four men who won top prize in a soccer pool and suddenly found themselves 1,739,361 kroner richer. But it turned out to be difficult to divide the money by four. 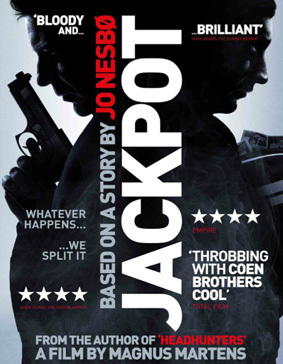 Described by Total Film as "throbbing with Cown Brothers cool" and the Sunday Mirror as "blooy and brilliant," Jackpot will be released on UK DVD on 7th January 2012 by Metrodome Distribution at a yet to be confirmed RRP.